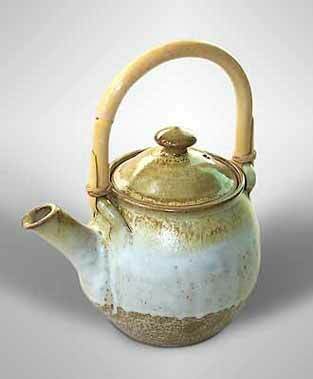 Cripplesease teapot - 9" (228 mm) high. The Pottery at Cripplesease on the B3311, the St Ives to Penzance road near the tip of Cornwall, was started 1967 by Anthony Richards and known as Penderleath Pottery. It was sold at the end of 1970s to Bill Longley of Greyshott Pottery and continued for a short time as Penderleath Pottery until Bill emigrated to Australia in the early 1980s. The premises were bought by a London couple who intended to run it as a craft centre featuring pottery and weaving, but their venture didn't take off. In 1984 it was sold to Dave Moran who was not a potter, but a figure active in pottery circles and he changed the name to Cripplesease Pottery. He sold work by local potters, notably Anthony Richards, for two years, and then sold the pottery to the current owners, Jamie and Dodie Herschel. Jamie was an experienced potter and Dodie, his wife, an accomplished decorator who was originally trained in textile design. The couple had previously run Prykernow Pottery in nearby Hayle. They use three electric kilns, one of 24 cubic foot capacity and two smaller ones. Various techniques are used for their earthenware and stoneware pots including brushed, incised, resist and glaze effect.